Trade scale verifiable up to 15 kg, resolution from 2 g, memory for base price, taring function, keys for direct prices, rugged ABS plastic housing, rotatable screen on tripod for the client, battery or network component, heavy steel plate, backlight. Trade scale should be verified when it is used for determining the price/weight ratio. No matter how small the business is, the trade scale verification is mandatory. This economic trade scale is verifiable, which means you don't have to go to a verification office. The trade scale is a an accurate weighing device and it determines the price of the weighed product in terms of the base price per kg or g. The numeric keys on the trade scale are used to directly enter the base prices, and it even allows to record some of them. The taring function key of the trade scale can deduct the weight of the package. The add up function allows the trade scale to weigh various products and then sum up the total price. 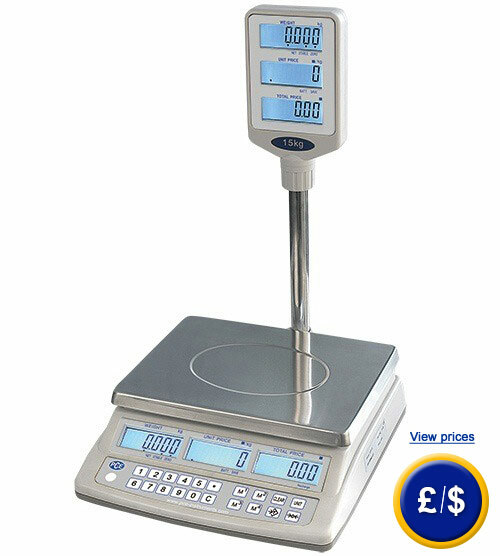 The trade scale has a triple screen for displaying the weight, the base price of 1 kg or 100 g, total price indication. The customer display can be rotated and placed on a tripod so that the client can see the information well. The height of the digits is 20 mm, allowing reading at a distance. Despite all its functions, the trade scale is very practical and easy to use. The trade scale is powered by battery or network component. It is easy to handle and it can operate at temperature -10 ... +40°C. Therefore, the trade scale is ideal for large and small businesses. Here you can find a verified trade scale, with a memory for base price and with receipt printer. If you have any questions about the trade scale, see the information below or contact us:+44 ( 0 ) 2380 98703 0. Our engineers and technicians will help you with the trade scale and any product of our regulation and control systems, meters or scales of PCE Instruments UK. -10 ºC ... +40 °C/max. 85 % R.H.
For companies that wish to integrate the trade scale in the internal quality control or for annual recalibration. The certificate according to ISO standards contains a calibration certificate that includes all measurement values. The name and address of the company or customer are included in the report. These adjustment weights are used exclusively for recalibration and the precise control of the scale. Here you will find an overview of all the scales and scales available in the offer of PCE Instruments.